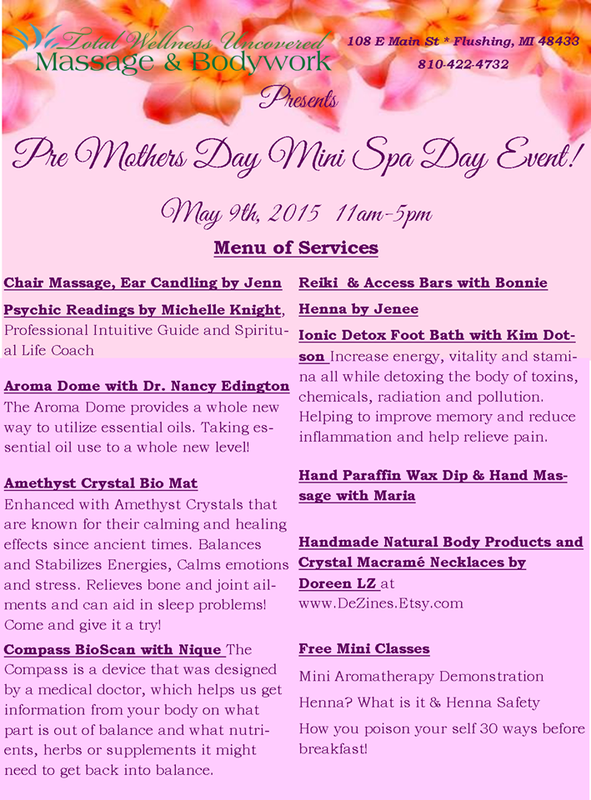 DeZines will be at ‘A Spa Day’ at Total Wellness Uncovered & Bodywork in Flushing, MI on May 9th! 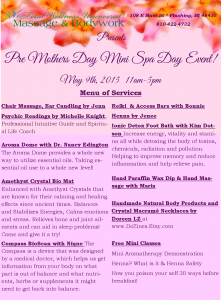 Stop in, Get Pampered and Shop for Mother’s Day or yourself! 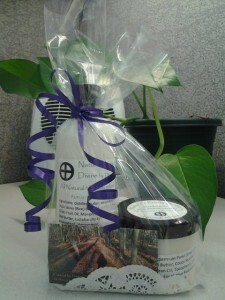 I will have my Body Product Line for sale along with my Macrame Healing Crystal Necklaces. 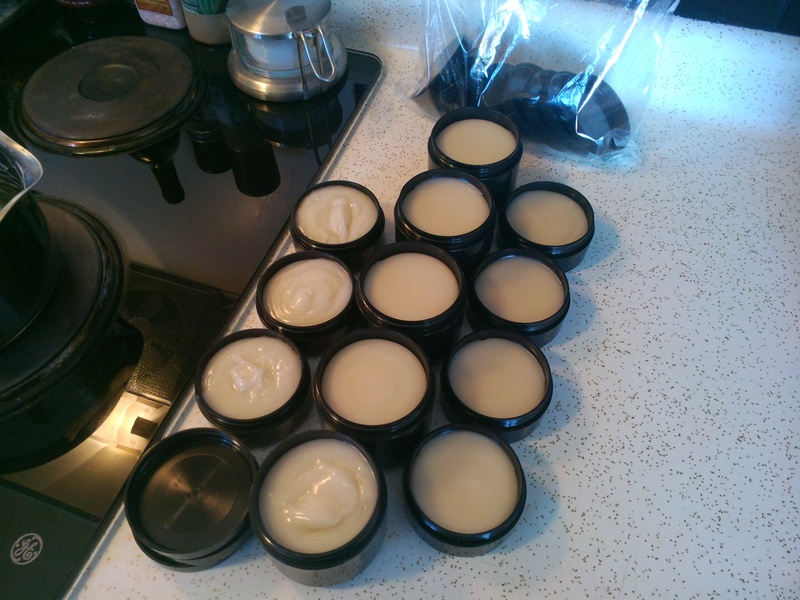 I just ‘cooked’ up a fresh double batch of my Mag-Ease-ium Cream – Remedy with Double Strength Magnesium Oil, Marjoram and Cedarwood. It is available in 2 ounce and 4 ounce jars. Click here and stop by my Etsy shop to read more about this amazing Remedy! Magnesium is vitally important to over 300 processes in our bodies, but very few of us get enough of it. Even those of us with an excellent, nutrient-dense diet are probably not getting enough magnesium. The problem is that our soil is horribly depleted. When a food says that it contains x amount of magnesium, that can be very misleading. In optimal growing conditions and magnesium-rich soil, it might be an accurate number, but that is seldom the situation. On top of a lack of magnesium in the diet, many prescription drugs can actually deplete magnesium. When we’re stressed, we burn through magnesium at an accelerated rate. Magnesium is needed for so many things, including restful sleep, digestion of food, heart health, fertility, strong bones, energy and so much more. I intuitively chose to add Cedarwood and Marjoram therapeutic grade pure essential oils to my Mag-Ease-ium Cream Remedy. Cedarwood is recognized for its calming and purifying properties. Its fragrant influence stimulates the limbic region of the brain (the center of emotions), and stimulates the pineal gland, which releases melatonin. Marjoram has muscle soothing properties that may help relieve body and joint discomfort. It may also help soothe the digestive tract and is a general relaxant. Its fragrance assists in calming the nerves. This is quickly becoming my second most popular Nature’s Body Product, with Run in the Rain Lotion Divine taking in all the glory!